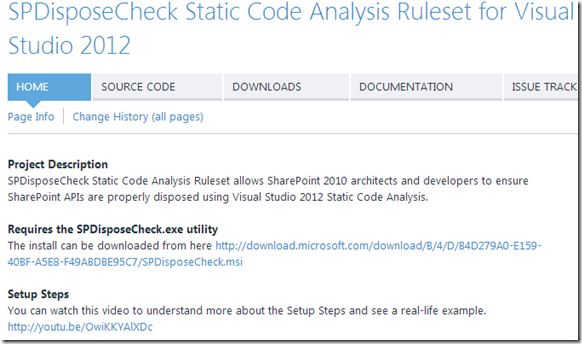 Do you remember the SPDisposeCheck Static Analysis RuleSet for Visual Studio 2008/10 ? It was pretty nifty, I’ve used it in many SharePoint 2010 projects and it did a great job. Yesterday, I decided to upgrade it to work with Visual Studio 2012 and I’ve published it today on CodePlex. You can get it from here. This wonderful RulSset has been originally created by Stephen Vick, I just tweaked it a little bit to make it work with Visual Studio 2012. 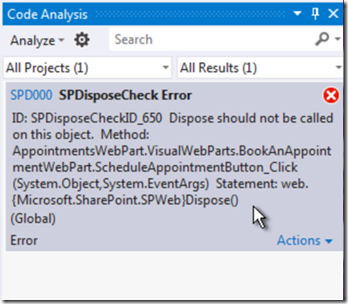 By using SPDisposeCheck from within your Code Analysis, you can avoid any future memory leaks that might occur because your developers didn’t properly dispose the SharePoint API objects. You can even prevent bad code from entering your Source Control system by creating a check-in policy that performs Static Code Analysis and spot any issues earlier. I have created a video that explains the setup steps and shows you a quick example. You can watch it here. SPListConfiguration is a SharePoint feature that developers can use to configure their SharePoint lists using XML and without the need of writing .NET code. SPListConfiguration can be used for many different purposes. For example, you can use it to set most of theproperties for the SPList object that references your list or to stop inheriting permissions from the parent web. You can even use it to add properties to the property bag of the list root folder. 1) From a site definition; in the <WebFeatures> element. Also keep in mind that you set any list properties of type String, Boolean or Int32 and this covers almost 95% of the available properties. You cannot set the log event level (e.g. low, medium, and critical) as it’ll always display the error level in the trace logs as High. Also you cannot control the trace category as it’ll always display the category as “General”. The logger is located in 12\ISAPI \Microsoft.Office.Server.dll and therefore it’s only available with the MOSS install, not WSS 3.0. 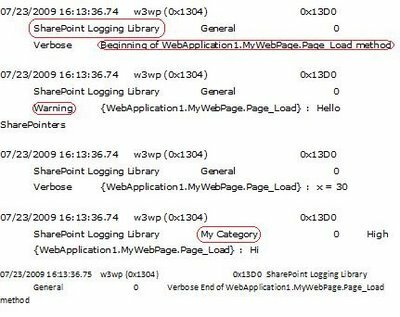 What if you need to write into SharePoint trace logs while having full control on the error level and category? Enter SharePoint Logging Library ! Get the “SharePoint Logging Library” from CodePlex. 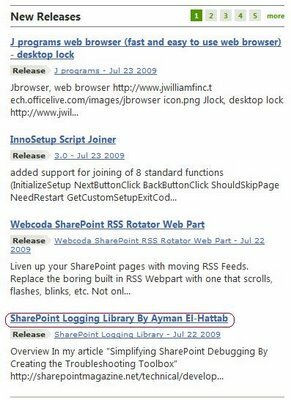 Add a reference to AymanElHattab.SharePoint.Logging.dll . Add a using statement to AymanElHattab.SharePoint.Logging namespace. Get your code executed , then open the trace logs. You can call the public methods SharePointLogger.LogStartOfMethod() and SharePointLogger.LogEndOfMethod() for writing to SharePoint Trace Logs .You don’t need to pass the method or class name, this will be automatically logged by Reflection as shown in the figure above : “Beginning of NameSpace.ClassName.MethodName Method”. You can control the severity and the category when you use the LogMessageWithSeverityAndCategory() Method. “General” is the default category when you use the methods that doesn’t accept a parameter for the category. You can log exceptions and their stack traces by passing the exception object to the public LogException() Method. Didn’t you find yourself writing SPContext.Current.Site, SPSecurity.RunWithElevatedPrivileges and list.Items.Add() more than hundred times in most of your SharePoint projects ? So Why Reinvent the wheel ? 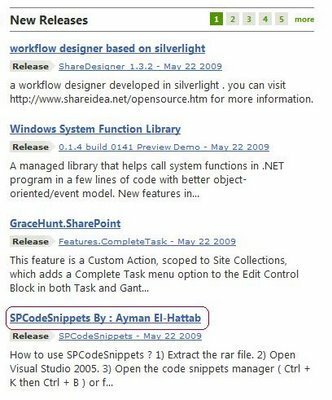 SPCodeSnippets provides the most commonly used SharePoint code snippets that follow SharePoint development best practices. Just integrate them into your visual studio , reuse the code and speed up your SharePoint development. AW Systems has just released an open source tool called SLAM (SharePoint List Association Manager). Check it out now on CodePlex at http://www.codeplex.com/SLAM. SLAM lets us do just that by allowing developers to describe complex relationships between lists and content types in a way not previously possible in SharePoint (at least not without a great deal of time and effort). With SLAM, these associations are managed automatically. Developers can then concentrate on building web parts and Custom Field Types that draw on those relationships using familiar and straightforward SQL queries.